As a teenager in the '80s, my high school drama class took regular trips to New York City to see Broadway shows. This was at the height of Cats fever -- and yet, I never did see it on Broadway, probably because we always bought discount same-day tickets shorty before the show, far too late to land Cats tickets. I wasn't bothered, since there was no shortage of cool shows to see. Still, I was always curious about the much-loved show. When I saw it was showing at the New Candlelight Theater in Ardentown, I had to cover it. 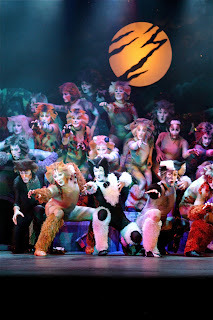 The Broadway run of Cats ended in 2000, having survived through the early '90s pop culture backlash against visual feasts. By the time Disney took Broadway by storm with The Lion King in '97, Cats, I suppose, didn't seem so modern anymore. What's funny, though, is that with mega-spectacles like Lion King, Cats, once the most commercial show in the world, looks almost avant-garde -- especially in the NCT's relatively small room. Andrew Lloyd Webber composed Cats based on T.S. Elliot's poems in Old Possum's Book of Practical Cats, a poetic guide to the sociology of the domestic cat. The show takes place over one night, when the cats leave their owners to have an annual gathering. Cats are humanized and humans are felinized with singing and dance, and it's all lots of fun to watch. NCT's production, directed by Dann Dunn, looked as spectacular as I'd imagined growing up. Jeff Reim's set design of an outdoor alley with a distinctive backlit moon overhead was beautifully done. The costumes, designed by Timothy Lamont Cannon, who also plays the patriarchial Old Deuteronomy, and the makeup were just right. A visual feast. Of course, it could be pretty as can be, but without real talent on stage, the production would fall flat. The cast has it. This is professional theater, Delaware, you don't have to wait for touring musicals to hit the DuPont. 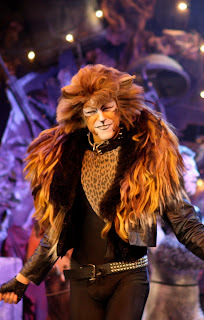 Highlights include Lindsay Mauck as Jennyanydots, Kaylan Wetzel as Bombalurina, David Synder as both Bustopher Jones and Gus, Erica Scanlon Harr as Grizabella the Glamour Cat, Ryan Blackson as Mr. Mestoffelees and the scene-stealing rebel Rum Tum Tugger, awesomely played by Cory Wade Hindorff. The show has a large ensemble, and it's all good. As always, the NCT serves a dinner buffet (included in the ticket price) and has a cash bar featuring wine, beer and themed cocktails. Cats runs through March 20th, 2011, and will be followed by their spring production, The Full Monty. Going to see the Cats at NCT next week. Personally know Ryan Blackson and can't wait to see him in this production. Saw CATS opening night and going back March 5 with 23 of my closest friends! WHAT A CAST!!! Amazing to put all those dancers...performers on one small stage in Delaware. You gotta' see it. Saw Cats this past weekend (2-27). AWESOME. AMAZING. MAJICAL. What an impressive amount of talent! Everything from the dancing to the beautiful vocals! LOVED IT! ALso, what a great little theater! So much fun! You've got to give it a try! SO worth it!